I couldn't post this before but we had a nice sell at the open on the NQ 3 min but was busy with my shorts in ES and ER2 so my hands were full. This is just to show you how weaker NQ is now. The Russel is showing some strength it just had a retest from a pivot made at 0400 est. Will it hold or turn the market, I don't know. I'm not taking the trade. 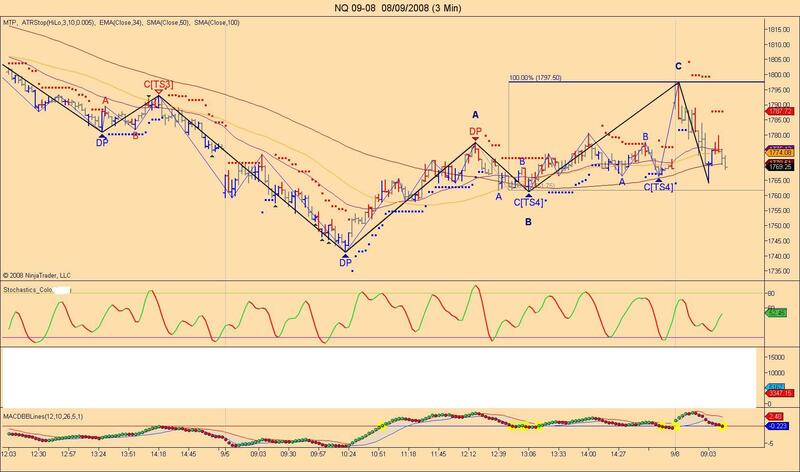 Wise choice Eddo I rely a lot on high tick time frame charts for ES and based on that I had a major filter reversal down so the reason I said this could be wave 1 up. Again I'm not saying it won't go higher but like you I prefer to have a calculated risk before getting in. The 50% retrace of the ES from Friday's low and today's top is 1257.25 on 24hr basis, We might not go there but we now have a possible ABC on the 5 min and tick too. DP is near 1260. I mentioned last night about fading such good news and in the back of my mind it went past the average of the 3 DAY RALLY a bit to give me some confidence of resistance. Sorry I made a mistake 1257.25 was the 38% and 1249.50 is the 50% current low is at 1250.50 now. I could not buy anyhting as my PC almost froze and was not updating my charts I had to close all my Internet Explorer windows to fix part of my problem but it's not 100% yet so I may have to reboot, unless I find which program cause that. That is correct the 3 day rally ended on friday. The higher high today is penetration of the SS day high. We always (100%)had a decline on Buy days since the beginning of the year. So for this to remain at 100% we need to get to 1245 to get atleast a 1 tick decline.